We may never know if Vijay Singh, 44, was going for the green or not when he rocket-launched a 5-wood that nearly beaned John Daly, 41, a few feet from the 18th hole. We do know Singh was laughing about it afterward on Friday, and if anyone can take a joke, it's Daly -- although he was a little red in the face, and not just because of the sun at Waialae Country Club. It was about the day in general after missing the cut by one stroke at the Sony Open. Still, Daly couldn't resist smiling about Singh's "flyer." Fun on the course, as well as life in general, is Daly's trademark. But a mirthful, perhaps mischievous Vijay Singh? The golfing machine with 19 tour victories since turning 40 is known more for his work ethic and grinding, no-nonsense consistency. Perhaps Singh has learned what some say is the key attribute for continuing to play well at golf's highest level throughout the decade that signals aging in our society -- the right attitude. "I certainly think fitness is important for players in their 40s," former tour pro and veteran TV commentator Mark Rolfing said. "But the most important thing is attitude. And I think for players in their 40s, their good attitude should come from experience. This whole age-old argument about the 20s, and the young guns, and all that, they're going to challenge Tiger and all this. I still think Vijay is going to challenge Tiger as much as Paul Casey or any of these guys in their 20s, because those guys don't have any experience." 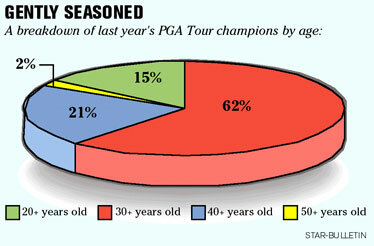 In fact, more players in their 40s won tour events than players in their 20s last year. "I think Vijay is lovin' life right now. He's won more in his 40s than any other player, maybe Sam Snead was close," Rolfing continued. "But to me, you cannot play good golf without a good attitude. Look at Hawaii. Talk to Vijay, Fred Funk. The guys who play the best here are the ones with the good attitudes, the ones who love it. The ones who complain about things, they don't play well." Singh, who won the Sony Open in 2005 at age 41, makes his success past the physical peak for most athletes sound simple. "Just keep healthy, keep fit," he said after Friday's second round at Waialae. "Keep believing you can go out there and compete. That's the main, most important thing. I think if I believe I can go out there and feel like I can compete, I'm going to be able to play well." Paul Goydos , Olin Browne and Rocco Mediate may be considered past their prime after joining the 40-plus crowd, but they have shown they can still play. Goydos, 43, stood in the winner's circle at last year's Sony Open in Hawaii, while Browne (48) finished tied for ninth in the 2007 AT&T Classic and Mediate's (45) best in 2007 was second in the Arnold Palmer Invitational. Distance off the tee is usually the first skill to erode as players age. It's debatable if new technology that allows golfers to hit the ball farther helps the veterans or youngsters more. "With me, distance is no longer a question. I don't have much of it," said journeyman pro Jim McGovern, 42, who hasn't won on the tour since his lone victory, in 1993 at the Houston Open. "But accuracy is key. Technology can also help you hit straighter, so it probably benefits both younger and older players. Definitely length is a key for a lot of the young guys." Rocco Mediate owns five trophies for tour wins, but hasn't hefted one since turning 40 at the end of 2002. He missed the cut here this year, but remains confident he can still compete for championships. He said his odds (actually everyone's) are better in events in which a certain golfer doesn't participate. "Absolutely, wisdom will always beat strength, down the stretch," Mediate said. "Tiger happens to have both of those." Mediate said technology doesn't help him, but he's learned to shape his shots for added distance. "I can't hit it any further if I tried, so it doesn't matter. We curve the ball. I've built my clubs so they can do that. I'm not concerned about distance at all," said Mediate, who has often battled back problems. "I think if you keep yourself in shape you can be competitive up until you're 50 on this tour if you know what you're doing. Obviously it's harder, it's definitely harder. Injuries set in sometimes." Paul Azinger hasn't won since capturing his 12th tour title a few days after turning 40, here at the Sony Open in 1990. As the Ryder Cup captain closes in on 50 he feels he still has a lot of top-notch golf left in him. And the personable Azinger will be a boon to the Champions Tour when he makes the half-century mark in 2010. In addition to the aging process, Azinger dealt with cancer in his right shoulder blade in December 2003, after piling up three wins in his best season, at age 43. Age is truly just a number to "The Zinger." "I don't see any reason why you can't (compete), unless your hands are shaking. There are several players who have proven they can do it. Craig Stadler won the BC Open when he was 50. If you can still hit the ball a reasonable distance (off the tee) you should be able to compete out here in your 40s," Azinger said after making the cut Friday. "I don't know if technology helps or not. It's all exponential the way it works. Corey Pavin's not benefited 5 yards because of technology, but some other guy might benefit 35 yards because of clubhead speed." In a game where failure is the norm, a sense of humor is also key. Azinger has a line for everything, even when the subject of steroids and human growth hormone comes up. "If they do a drug test, I'm going to eat as much asparagus as possible the night before," he quipped. Mediate summed it all up. "The young kids are going to bring up their side of the game beautifully. Their generation is fine. Ours is fine. The one before, too. We've all had a good time," he said. "The game is changing, it's changing every day. But I still think we can do some damage."